That’s my personal rationalization for reading In the Cold Dark Ground. Stuart MacBride is a very good author. He knows how to ramp up a story, and he can get off marvelous ironic lines, like, “When he smiled, it was like small children screaming.” But the darkness of the story and the ugliness of most of the characters wore me down. It’s probably an accurate picture of police work; it just leaves me feeling grim. And I started out grim enough. Anyway, in this book Sergeant Logan McRae of Banff, Scotland, who’s been an inspector but didn’t like it, is faced with doctors’ recommendations that he turn off respiratory support for someone very dear to him. He also discovers that his mother has lied to him all his life about a pretty important matter. Meanwhile, a local businessman is found brutally murdered, and there is evidence of a secret life and deep debts to organized crime. Speaking of organized crime, a local crime lord is dying. He has taken, for some reason, a liking to Logan, and is threatening to leave him his money and whole organization. This would not look good to the Professional Standards department, but it looks even worse to one of that boss’s underlings, a psychopath who has personal plans for Logan involving slow carving and pig feed. Meanwhile that same Professional Standards department is pressuring Logan to find evidence against his superior, Inspector Steel, a blousy lesbian with a remarkably unpleasant personality, but a friend nonetheless. So Logan has quite a lot on his plate. Things will get very tense before he finds a way out. 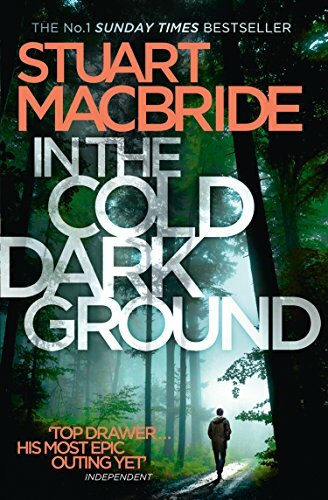 In the Cold Dark Ground is compelling, fast-paced, and well-written. I just don’t enjoy the overall experience of entering that world. Your mileage may vary. Cautions for very crude humor. And I’ve got one more to read.